The Cambridge Satchel is easily recognizable as a L.A.M.B. handbag if you're familiar with the brand. It is similar to several other L.A.M.B. designs like the Galloway and Hopewell with a uniquely printed pattern and classic shape. One of the signature features is the racing stripe running down the front and back of the satchel. 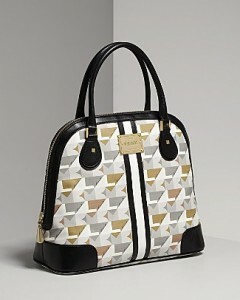 The black and white leather strip breaks up the pattern and adds a bold statement to the bag. Other leather details on the Cambridge include the double rolled handles, handle anchors, and side panels. The coated canvas print is fairly muted, which is a nice change from some of L.A.M.B. 's other bright options like tie-dye. If you look closely, you'll see the brand name in cursive throughout the otherwise abstract pattern. The brand's logo can also be seen on the engraved gold plate that sits on the front. The formal-looking piece of shiny hardware kind of contrasts the casual air of the stripe, but L.A.M.B. is all about the unexpected details. The interior is lined with the signature striped fabric. The Signature Cambridge retails for $495.